Test Data: 1.71 WPDA .49 BF 7.4 LE at 300 lbs. This guy was the most different Berkshire boar in the barn this Summer at the 2016 STC in Springfield, IL. Him and his littermate sister we so tall fronted and extended through their head and neck. They both had really good feet and toes. They both had really good hip and hind leg set. They both were big bladed and heavy boned, both had good length of side and length of hip with plenty of body to go with all of that shape and muscle. She went on to be the Grand Champion Record selling Berkshire gilt at the 2016 STC at $22,500. 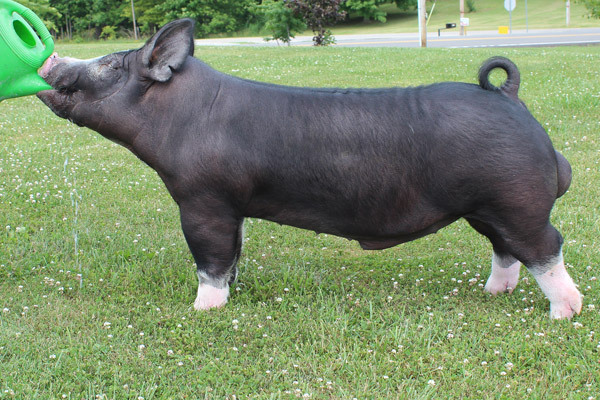 Juice It placed 2nd in class to the Mauck boar entry. This guy is one intriguing boar. His length of front end and his height at the point of shoulder as well as his structural design is incredible. Click here to see a video of this boar. Click here to see a video of littermate gilt.